When will you be checking in? Our luxury safari tents offer a memorable safari experience without compromising on comfort. Home to the Big 5 as well as the lesser known "Little 5". Each suite is well appointed for guests’ optimal comfort with every amenity, including large, en-suite bathrooms and an indoor and outdoor shower for the more adventurous. 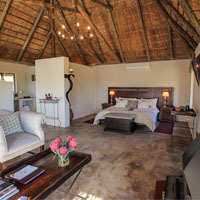 Bukela Game Lodge is not simply a luxury 5-star lodge, it's a safari experience like no other. The reserve is abundant with wildlife, birds and a vast variety of flora and fauna. Explore our unique offerings of safari activities here. Because it's hard to say goodbye, we want to give you the chance to spend an extra night at our beautiful lodge. Squeeze in an extra two game activities, sample some more of our fine South African wines, and indulge in one last delicious dinner. 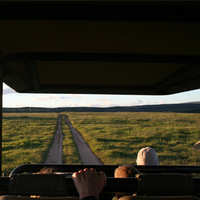 Bukela Game Lodge is a 5-star luxury lodge in the Amakhala Game Reserve, Addo Eastern Cape, South Africa. Accommodation at this tranquil luxury game lodge is provided in four suites and ten luxury safari tents, each individually styled in African simplicity while never compromising on luxury. This secluded safari destination is tucked away into indigenous trees and bushes at the top of a hidden valley and has the perfect setting for the intimate and romantic guest experiences for which we are renowned. Connected by a wooden walkway, our thatched suites and luxury safari tents offer a remarkable private wildlife-viewing experience. Indulge in sumptuous high teas, private candlelit dinners or exciting fireside boma dinners under African stars. And as you fall asleep, hear the silence broken by the unmistakable sounds of elephant and buffalo making their stately progress through the unfenced camp. 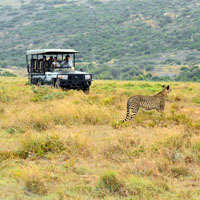 We offer morning, afternoon and evening Game Drives under the guidance of qualified rangers. It’s our privilege to create moments like these, and to share them with you. Our lodge may also be booked exclusively as a restful and beautiful venue for small team-building, conferences and weddings.Contact us for more information and pricing.